How beautiful you are, O’ Damascus, on this rainy day brimming with joy, in the month of May. Unexpectedly; the rain washes over the Damascian country side, flirting with the earth and roses -since last night and till the sun arose on the eighth day of May. I left early in the morning with my children, on our way to school, making use of our umbrella that we seldom need at this late stage during spring. Umbrellas – covering the heads of students – girls and boys, teachers; both women and men, scrambling towards the doors of the school, to procure knowledge and wash away their ignorance. But there are those insistent on wearing their summer garb: enjoying the touch of the cascading raindrops as they drizzled down their tender bodies. Such a beautiful site permeates the faculty of seeing with tenderness and love. Faces, suffused with joy, as the rain fell upon the flowers of life, and those carrying books and pencils, accruing knowledge and wisdom along their way. 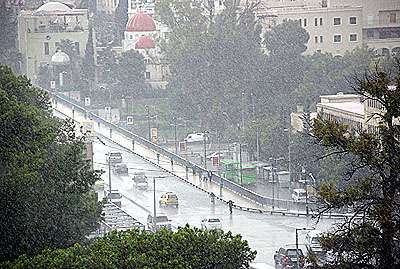 Hours passed, and the rain continued to shower the geographical landscape of Damascus and its countryside. Across alleyways, streets, gardens, and homes that yearned for blessings from above. Beads of rain nourishing desiccated soils, flowers and roses. The roses giggled for passers-by, perfuming the hearts of lovers of life and peace. The climate of goodness lightened the skies looking down on Damascus and several Syrian cities, smothered by dust. The grounds, roads, walls, tree leaves where dust had accumulated were all cleared, washed; set free from the dust and smoke. For the first time I see affected in this way by rainfall in the month of May. The sun disappears behind opulent clouds. More joyous is that the downpour has stopped; motor shells no longer rain down on the Capital of peace and history from today onwards. The sound of rain drowning out noises emanating from the maddening shroud. Today, Damascus, you are gorgeous; no motor shells, no smoke, no fear. Waves of hope and optimism pervade sad spirits, as the skies bless our souls and spirits. Trees left thirsty, regaining vitality; cleansing themselves of the dirt shed by humans with time. Damascus and her siblings dispose of their cloaks of sadness, grief, blood, and tears, preparing to wear celebratory costumes of peace under the rainfall of May, once the bloodletting the unrestricted spillage of Syrian blood reaches a close. Moments spent under the pouring rain in May, opens up spaces of hope; purging the human body and spirit of hatred. We miss the days where our time was spent travelling freely and without fear, rather than the present climate of unknown fate which awaits us.